There are tons of myths about how the music industry operates, and when you're trying to break into the business, these misconceptions can send you down the wrong path in a big way. This is part five in a series looking at common music business myths so you can avoid falling prey to them. Be sure to check the bottom of the article for more information. Let's get one thing straight up front here — you can do a lot yourself in the music industry. This is not an argument that you need some big major label behind you pulling the shots or that you need to give up a lot of control over your music career to make it in the business. No way! DIY ethos in the music industry often leads to the best of everything — the best music, the best labels, the best show — you name it. In fact, being able to do a lot of things yourself in your music career will pay off for you in a big way. 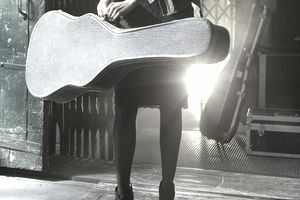 You May Not Know the Ropes: If you're new to the music industry (or even if you're not), you're bound to enter uncharted territory at some point. As you might recall, another music industry myth is that you shouldn't admit you don't know something — and when you're trying to take your career in a new direction, it's a good idea to find someone who can help you figure out how to make it happen. Help is good. You Don't Have Time: No one has time to do everything. If you take on too much, everything is bound to suffer. When you're trying to build a music career, the work is seemingly endless. Delegation is a skill, and so is knowing where you're strong and where you're weak and bringing in people who make up for your weak spots. This issue is especially important for musicians. When you're running the business side of the band single-handedly, you're distracted from the music itself. Although it's not always practical or possible, having someone take on some of these tasks for you is ideal. You Don't Have the Connections: You need to be careful about who you work within the industry, but if a legitimate manager comes along that has been at this a little longer and has the ability to open some doors for you — go for it. Outside Perspectives Help: When you're running things yourself, it's easy to get so wrapped in your small projects that you don't see the big picture. Having someone else around brings in a fresh perspective and can help point out potential problem areas you have overlooked. Here's another way to look at this notion. Taking a DIY approach doesn't absolve you from having to do all of the same work that the big companies do to promote an album, promote a show or any other music related task. The process is still the same, and since you have far less pull than a bigger company, if anything, you need to work harder. That is why DIY usually isn't so much "do-it-yourself" as it is "do-it-with-a-small-group-of-likeminded-people." So, keep in mind, although you don't have to sacrifice your rights and your control of your music career, sharing some of the responsibility in a way that works for you can help you reach your goals faster.